Here’s a quick rundown of the two major news items regarding the LGBT community (along with my spin). Enjoy! You don’t agree with us? Like, we say ‘poh-tay-toe’ and you say ‘poh-tah-toe’ kind of don’t agree with us? Or you don’t think homosexuals are equal kind of don’t agree? Because if it’s the latter, then it is lack of respect, Mr. Barilla. He went on to say that “Ours is a classic family where the woman plays a fundamental role”, and then, to cap it all off, Barilla added that if gays don’t like it, we can eat another brand of pasta. So your idea of a classic family is one where dad is the breadwinner, and mom is some frail, dumb woman in a dress and apron cooking and doing laundry in high heels. You realize it’s nearly 2014, not 1954, right Mr. Barilla? 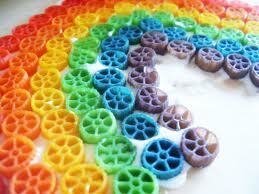 Oh, and I certainly hope you don’t make rainbow pasta. I’d hate for one of your ‘fundamental women’ to be influenced by pasta borne in the depths of Hell and suddenly have a strong desire for seafood. Of course, the backlash was immediate and intense. And of course, good ‘ole Guido was forced to backpedal, apologizing for hurting some people’s “sensitivity”, but still insisted the ‘traditional family’ was always associated with the brand. He also reiterated his support for gay marriage, but is apparently against gay adoption. Right, because the ‘traditional family’ still exists in society today. The ‘traditional family’ went out the window when divorce rates hit 50%. The ‘traditional family’ is relative, Mr. Barilla. There is no template for this ‘traditional family’ anymore. And let me ask you this, Mr. Barilla – would you ever have a single parent in your ad? How about an ethnically diverse family? These are not ‘traditional families’…do you not agree with them either? This story surfaced back in 2011 – the one where a Salvation Army media director went on a radio interview with a public radio host and then basically said that gays deserve to die. Now, this whole interview arose because of Salvation Story: The Salvationist Handbook of Doctrine, wherein the ‘rules’ of the ‘soldiers’ of the Salvation Army are contained. Many chapters refer to homosexuality and use Scripture to condemn it, including Romans 1:18 – 32, which includes condemnation to death. I visited their website, and found some confusing statements. #11 under ‘What We Believe’ states: We believe in the immortality of the soul, the resurrection of the body, in the general judgment at the end of the world, in the eternal happiness of the righteous, and in the endless punishment of the wicked. However, their mission is, in part, ‘to meet human needs in His name without discrimination. So which is it, Salvation Army? Are your ‘soldiers’ sent out to punish the LGBT community? Or to help meet their human needs? Or do they not have human needs because homosexuals are an abomination? You know what is an abomination? An organization that gives itself ‘ranks’ like General and Major and Lieutenant, but doesn’t actually fight in wars or specifically help veterans. The ‘National Commander’ William Roberts makes a yearly compensation in the 6 figure mark. He made nearly $127,000 back in 2009, which is more than an actual Naval Commander. You know, the kind that actually served in the military and put their lives at risk to protect our freedom? Of course, each time this story emerges, another round of boycotting is called for, which I find myself on the fence about. I mean, who’s to say someone at one of the SA missions might turn away a homosexual based on their inherent ‘need’ to follow these ridiculous by-laws? But at the same time, if the money you donate goes to help a needy family, who is really being hurt by the boycotting or the stopping of donated change? If you donate this Christmas, and really want to make an impact, donate to your local LGBT groups. Maybe Barilla will cater the Salvation Army’s next company party.